to be held from October 16-20, 2016 at the GFZ German Research Centre for Geosciences. This training course will touch upon all relevant aspects of continental scientific drilling, including project planning and management, pre-site surveys, drilling engineering, sample handling and storage, on-site studies, downhole logging, data management, and post-drilling measures. 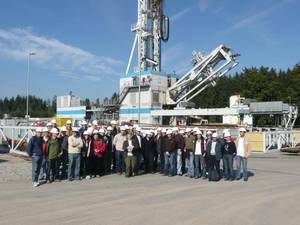 The training course is recommended for master students, doctorate students and post-docs involved in scientific drilling. Deadline for application is June 15, 2016. Decisions will be communicated by end of July. Preference will be given to applicants involved in ICDP drilling projects, applicants from ICDP member countries, developing countries, and those from countries considering ICDP membership. For the successful candidates, expenses including those for travelling, visa, meals and accommodation will be covered by ICDP. Applications should include a letter of interest, CV, and at least two letters of support.